#6 Troubleshooting Issue: Why can't I get channels 2 through 13? Our antennas have a digital VHF and a digital UHF range that vary based on the style of the antenna. Non-Amplified Indoor Antennas: 10 mile VHF range. Amplified Indoor Antennas: 20 mile VHF range. Roof/Attic Mount Antennas / Leaf Glide Indoor Antenna: 45 mile Vhf range. One thing that some people do to be able to pull in the VHF stations that they desire but are not able to get with their digital antenna is add a set of rabbit ears to their set up. Using an A/B switch allows you to connect two antennas to your TV. The Mohu antenna for the digital UHF and digital VHF signals that are in range and the rabbit ears for the VHF signals that are out of our antenna's range. You would "switch" from A to B depending on what channel you were wanting to watch at the time. It can be cumbersome but it is a way to get the channels you'd hoped for. 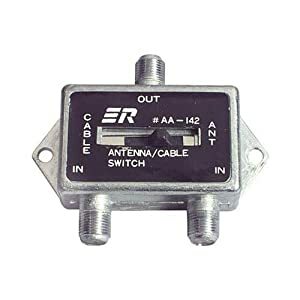 Here's a photo of an A/B Switch for reference and they can be purchased at any retailer that sells electronics.